Crude oil prices remained mixed and ended at bullish tone, bearish factors during the week were inventory report, last week oil rig data, Brent and WTI profit taking, whereas bullish factor is OPEC production cut extension expectation. Brent prices closed on $62.72/BBL on Friday, while WTI closed at $56.55/BBL. As per EIA data, another recording breaking US production number of 9.645 million barrels a day, increased by 25,000 barrel a day from last week. 10th November 2017 EIA report of US crude export of 1.129 million barrels a day, an increased of 260,000 barrels a day from last week. EIA Weekly report reported a surprise build up of 1.9 million barrels with stock at 459.0 million barrels on 10th November 2017, against a market expectation of 2.2 million barrels drawdown. Gasoline inventories at 210.4 million barrels reported on 10th November 2017, recording 0.9 million barrels build up against a market expectation a 0.9 million drawdown. Baker Hughes rig count reported at 738, same as last week. Brent-WTI spread remained wider around $6.50 level throughout the week as evident from increased US oil export number. Brent future prices in backwardation with closure on Friday at $62.72/BBL, $62.57/BBL & $62.30/BBL for January, February & March 2018 respectively, resulting in profit taking as traders off loading super tanker loads. CME WTI curve market closed on Friday at $56.68/BBL for December, $56.80/BBL for January and $56.88/BBL for February, depicting contango in short run whereas long run prices are in backwardation, so shale producer hedging their production through selling futures. As reported last week also, crude oil fundamental still supporting a bearish run as US production on the rise and US production are making way to Asian market. OPEC production cut extension is already incorporated so if there is no extension announcement then market can go for a free fall otherwise long term is a bearish outlook. Henry Hub prices had a bearish outlook, as there was news of moderate weather in some part like Pacific and South West. However, based on cold weather outlook over the weekend, prices closed at higher level than Thursday at $3.10/MMBTU. Demand was 89.6 BCFD versus supply of 82.2 BCFD, with residential demand jumped from 21.7 BCFD to 30.5 BCFD. Baker Hughes reported an increase gas rigs by 8 and total number stands at 177. Working gas in storage was 3,772 BCF as of Friday, 10th November 2017, first net withdrawal of 18 BCF at the start of heating season, with market expectation of 14 BCF withdrawal. CME Henry Hub future on Friday closed at $3.132/MMBTU for December, $3.219/MMBTU for January and $3.213/MMBTU for February, depicting uncertainty on oversupply situation. Dollar remained bullish till Thursday as there on US tax reform bill approval by House of Representatives and UX DXY went up to 93.90 on Thursday, however, turned bearish on Friday, on political instability due to as Russian probe, S. dollar index closed at 93.66 on Friday. Euro remained stable on primarily on strong economic data especially from Germany and closed at 1.17965 on Friday. AUD/USD remained bearish due to strength in JPY, the pair closed at 0.75618 on Friday. Japanese Yen remained bullish as US bond yield set lower and closed at 0.00893 (111.98) USD/JPY). North West Europe: Weather eased a bit, however still remained cold, expected to remain same next week. South West Europe: France is cold, expected to ease a bit next week, while Spain and Portugal enjoying mild cold weather. Latin America: Still hot weather and expected to remain same next week. Middle East: Weather is easing a bit with Egypt is expected to be Mild next week, rest of Middle East is still in high 20 degrees. South Asia: India and Pakistan in mixed season where demand for Natural gas is high due to heating in North and air-conditioning in South. North East Asia: Korea and China in cold weather with same outlook, whereas Taiwan still hot and Japan is enjoying mild weather. South East Asia: Still in summer season with same outlook for next week. North America: Mexico still in warm season with same outlook, whereas US weather eased with mild temperatures other than South East and North East and outlook is for mild weather next week. One standard size Vessel of 150,000 m3 equals to 3.42 BCF. 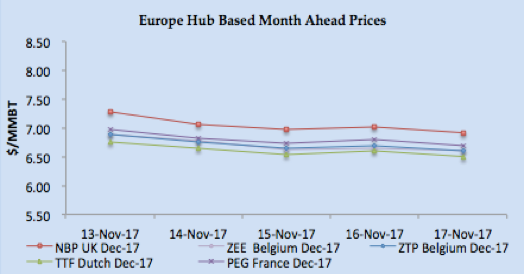 North West European gas hub prices started bullish but then had a bearish run throughout the week primarily on mild weather outlook along with bearish crude prices plus adequate NG and LNG inventory level plus regular supply from Norway and Russia, however there is a planned outage from Norwegian gas supply till 23rd November 2017. NBP UK Day Ahead price closed at 52.223 Pence/Thm ($6.90/MMBTU) on Friday, increased by 1.0% from last Friday. NBP UK Front month price closure was on 52.331 Pence/Thm ($6.91/MMBTU) on Friday. TTF Day Ahead closed at €19.25/MWH (equivalent of $6.65/MMBTU) whereas front month price closed at €18.812/MWH ($6.50/MMBTU). South West Europe prices remained stable as weather is getting cold in France along with still lower hydro based electricity generation in Spain on reduced water level. Gas and LNG inventory level are also low in South West Europe. Day Ahead PEG Nord closed at €19.45/MWH ($6.73/MMBTU) on Friday, whereas TRS France at €25.319/MWH ($8.75MMBTU), and Spain at €24.70/MWH ($8.54/MMBTU). November & December PEG Nord forward prices closed downward at €19.35/MWH ($6.69/MMBTU) & €19.66/MWH ($6.80/MMBTU) on Friday. Overall Natural Gas prices impact on LNG from US and Europe seems bullish specially for winter season as UK has reduced storage space plus lower Hydro will keep the pressure on Spanish electric prices. LNG prices remained range bound till the news came in on deals made by Kogas for ten cargoes; overall sentiments on LNG are bullish due to cold weather outlook from China and Korea. Regular suppliers on contract basis are all locked-in especially from Qatar, and Japan and Taiwan still procuring contractual volumes. There is bullish sentiment arising from European market as focus is on for January cargoes now, so market is very volatile and coal price along with lower coal inventory in India are also helping the price to inch upward. Indians are heard to procure at around $9.50 level and due to smog issue in New Delhi, Indians are also looking for spot cargoes. Japan, Korea, Taiwan and India along with Pakistan still getting regular contractual volumes and based upon based upon 3-0-1, 14.5% Brent slope, price is around $8.00/MMBTU, whereas current NEA price for this week translate into 17.6% of last three month Brent. 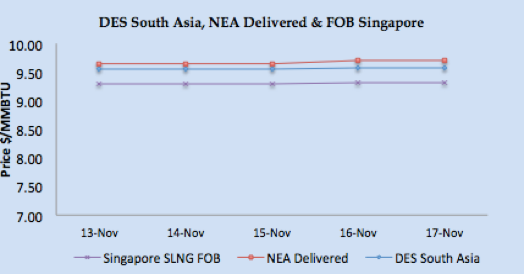 Asian price closures on Friday; SLNG NEA Delivered at $9.69/MMBTU and FOB Singapore at $9.33/MMBTU. 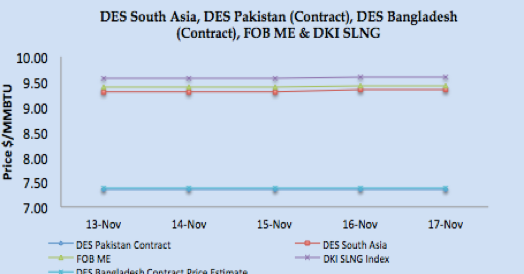 Based upon FOB Singapore and Middle East, DES South Asia is calculated around $9.57/MMBTU level. DKI SLNG Index on Friday reported at $9.59/MMBTU. JKM Future curve market bearish with front month at $9.675/MMBTU along with $9.65/MMBTU & $8.55/MMBTU for February & March 2018 respectively, so basically focuses now on January deals. North West European LNG prices still in bullish run due to arbitrage window open for re-loads from Europe for Asian destination. Belgium reloaded one cargo for Egypt, Belgium, Greece and Poland received one cargo each this week and still no vessel arrived at UK since last three weeks. 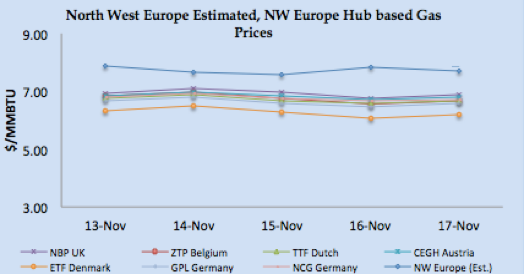 North West Europe closed at around $7.70/MMBTU, 60 cents premium on NBP January price. South West Europe LNG also bullish on Asian prices along with lower inventory and increased electricity price due to low generation from nuclear and hydro. 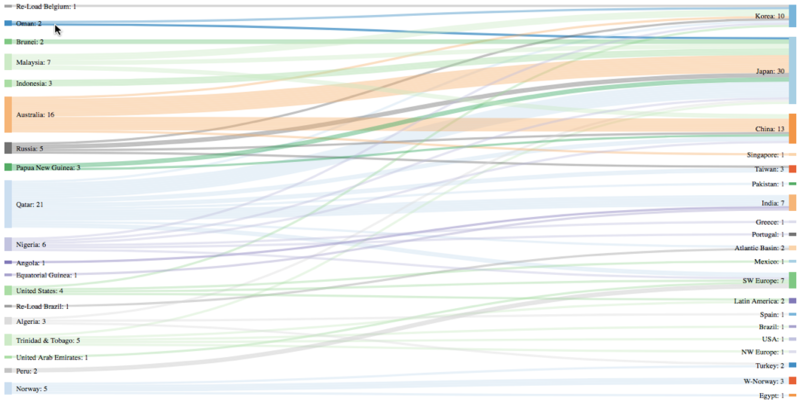 Spain, Portugal, Italy and France received total of six cargoes with 2 cargoes for France this week. 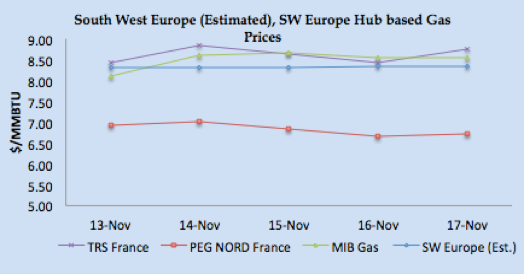 Based upon Iberian Peninsula gas hub price, PEG Nord and TRS along with Asian prices, South Western Europe prices are estimated in the range of $8.30/MMBTU. The arbitrage window still lucrative for reloads from European ports, $8.09/MMBTU is the netback price for South West European ports. US Gulf Coast producer price on FOB basis for December delivery for Asian destination comes around $8.30/MMBTU level, for European destinations the netback comes around $7.15/MMBTU level. 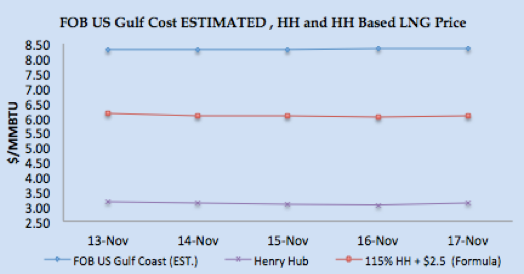 US Henry Hub based price is coming around $6.07/MMBTU for US based liquefaction companies, which translate into $2.23/MMBTU for Asian destination & $1.08/MMBTU for European destination. LNG price remained stable despite bearish run crude as demand and supply fundamentals now supporting a bullish run for January prices. Cargoes availability besides regular term cargoes is diminishing as buyers are focusing more on maximizing term buying. India and China if back in the market along with Korea can put further pressure on the prices. 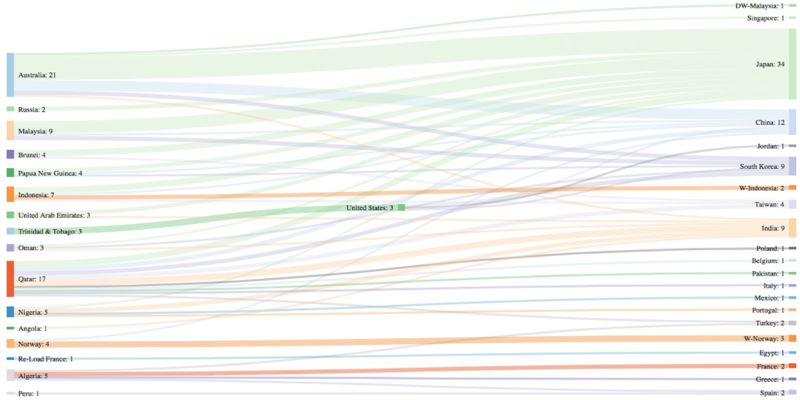 LNG merchant data is developed in collaboration with Clipper Data LLC. 89 vessels carrying 5.95 million tons (285.37 BCF) loaded from various supply centres. 93 vessels carrying 5.92 million tons (284.30 BCF) discharged at various demand centres. Two reloads, one from Belgium and one from Brazil. Disclaimer: This is a personal analysis based upon public information and should not be used for buying and selling of commodities. Source: SGX LNG Index Group, EIA, GIE, and Reuters.